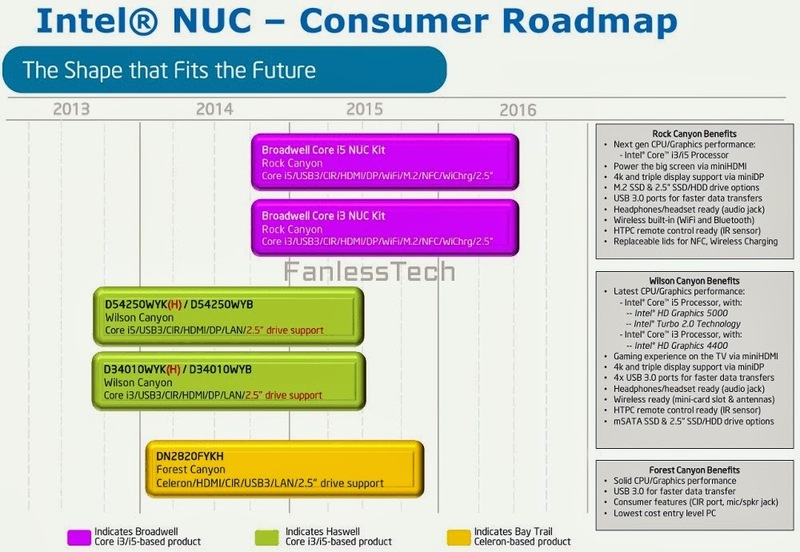 A new roadmap, supposedly leaked from Intel, shows the chip giant continuing to push its NUC (New Unit of Computing) platform but that systems based on Broadwell won’t arrive until the very end of the year. That fits with what we’ve heard about a delay for the 14nm chip in general, but there’s no plan to bring a socketed version of Broadwell to market for desktop users. 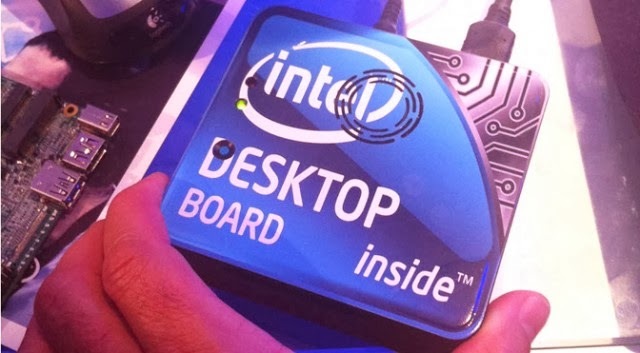 Supposedly Intel will do a Haswell refresh this year (still compatible with existing Haswell motherboards), then a new desktop chip launch in 2015. The two NUCs aimed at the consumer market would include a Broadwell CPU, integrated graphics, and offer support for USB 3.0, an M.2 SSD, a consumer IR sensor, and replaceable lids for both wireless charging and near-field communication (NFC). Intel notes that its new platform, codenamed Rock Canyon, will be capable of driving up to three displays and/or a 4K display. Technically the current products are also capable of this, but the existing Intel GPUs just aren’t strong enough to drive triple-headed gaming or 4K, for that matter. How much graphics horsepower can Broadwell bring to bear? One of the big questions for how successful NUC’s can be will depend on whether Broadwell closes the gap with discrete GPUs from AMD and Nvidia. Last summer, Haswell’s Iris Pro configuration was one of the fastest integrated graphics cards ever launched, but comparisons against AMD hardware were fundamentally flawed by limited availability and high prices on the Intel parts. If you weren’t prepared to drop a pretty penny on a laptop, you weren’t buying Iris Pro. Whether Intel changes that equation with Broadwell remains to be seen, but it could shape the entire future of the NUC brand. 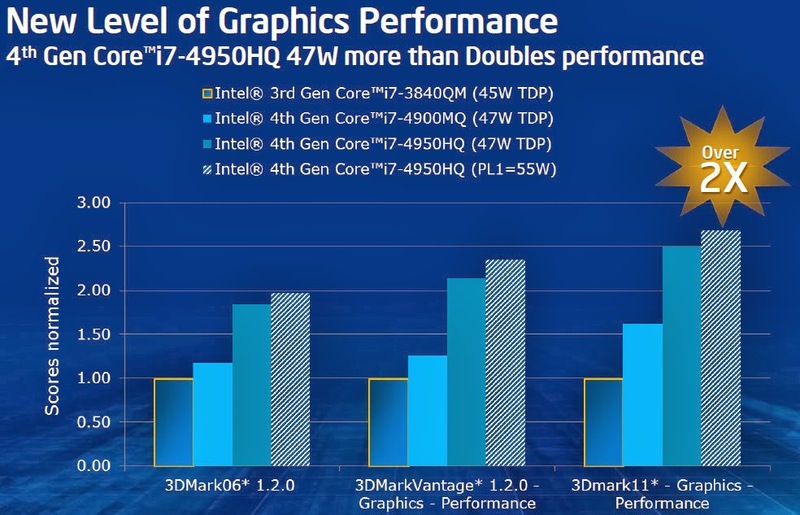 Previously, Intel had promised gains of up to 40% over Haswell’s integrated GPU, thanks to a mixture of efficiency improvements, new features, and (it’s rumored) a wider graphics core. Current estimates suggest that GT2 will have 24 EUs, up from 20 on Haswell, while the GT3 configuration will have 48, up from 40. Toss in a wider deployment of Intel’s 128MB L4 EDRAM cache, and the next generation of Intel chips could make their own bid for Steam machines or a similar position in the living room. AMD, of course, has Kaveri and its best-in-class GPU, but Kaveri has slammed up sharply against the limits of dual-channel DDR3 memory. AMD could be toying with the idea of using a GDDR5 memory interface to alleviate the bottleneck, but apart from a few tantalizing hints in product documentation there’s no word on whether or not the company will seriously pursue this. One way or the other, it looks like graphics will play a central role in the AMD versus Intel matchups of 2014. If Intel’s 14nm deployments are actually delayed until the end of the year, it’ll give AMD some breathing room to push forward with its own plans for 20nm, and possibly steal a march under Santa Clara’s nose.